(5/10) The last of actress Faith Domergue’s three science fiction movies of 1955 was a British quota quickie. Released as The Atomic Man in the US, it concerns two journalists investigating the case of a radioactive man who gets pulled back from death on the operating table and seems to be out of sync with time, all while his doppelgänger is involved with secret and potentially dangerous nuclear experiments. The sci-fi is underdeveloped, the science laughable and the script flawed, but entertaining and even exciting. Ken Hughes directs solidly and the acting is excellent. 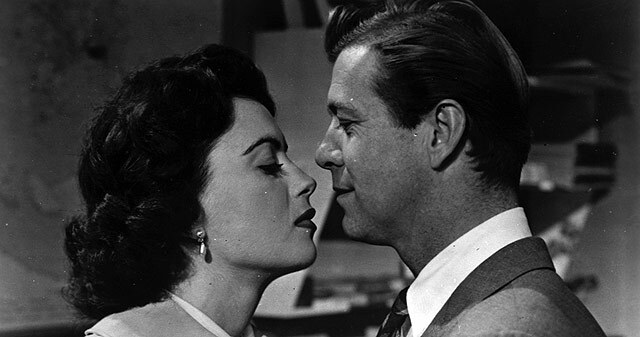 Faith Domergue and Gene Nelson as reporters and lovers in Timeslip. 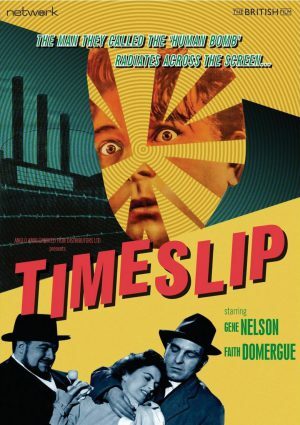 Timeslip (1955, UK). Directed by Ken Hughes. Written by Charles Eric Maine. Starring: Gene Nelson, Faith Domergue, Peter Arne, Joseph Tomelty, Donald Gray, Vic Perry. Produced by Alec C. Snowden for Merton Park Studios. IMDb score: 5.5/10. Tomatometer: N/A. Metascore: N/A. 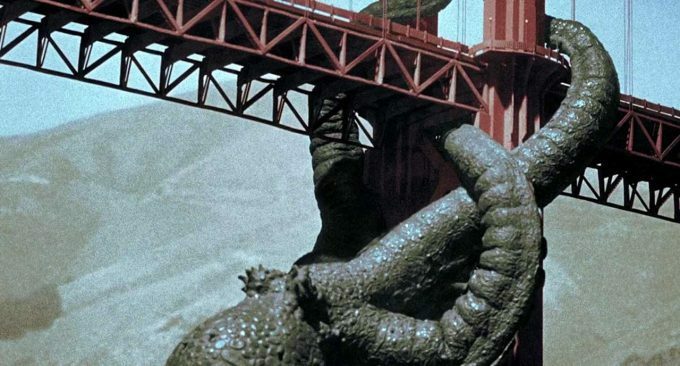 (4/10) A giant radioactive octopus destroys San Francisco in Columbia’s stale rehash of The Beast from 20,000 Fathoms. This low-budget programmer is saved by a good leading cast and Ray Harryhausen’s stop-motion animation. George Worthing Yates writes a strong part for scream queen Faith Domergue, giving it a feminist slant. The hero from King Dinosaur, William Bryant, is back in a bit-part, but this time it is sci-fi stalwart Kenneth Tobey’s turn to ”bring the atom bomb”. The hexapus attacking the Golden Gate in the later colourised version of the film. 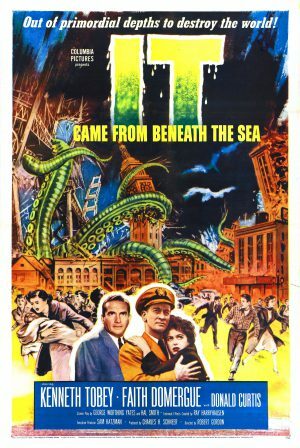 It Came from Beneath the Sea (1955, USA). Directed by Robert Gordon. Written by George Worthing Yates, Harold Jacob Smith. Starring: Kenneth Tobey, Faith Domergue, Donald Curtis. Produced by Charles H. Schneer for Clover Productions. IMDb rating: 5.9/10. Tomatometer: 67% Fresh. Metascore: N/A. 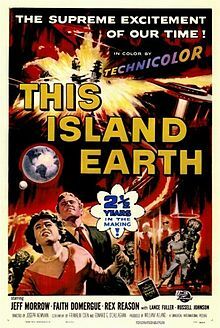 (7/10) Dishing out the best visual effects in US sci-fi up until 1955, This Island Earth is the smartest sci-fi film of the fifties all the way to the middle of the movie, when the two hack screenwriters deviate from author Raymond Jones’ novel, and we plunge into comic book territory. However, this first space opera remains one of the best sci-fi films of the decade, despite a clumsy mutant and the fact that the writers forget to add any actual plot once we get to a distant planet. Features the first ever Miss Finland. Jeff Morrow, Faith Domergue, Rex Reason and Lance Fuller watching Earth from afar. This Island Earth (1955, USA). Directed by Joseph M. Newman & Jack Arnold. Written by Franklin Coen & George Callahan. Based on the novel This Island Earth by Raymond F. Jones. Starring: Jeff Morrow, Rex Reason, Faith Domergue, Lance Fuller, Russell Johnson, Douglas Spencer. Produced by William Alland for Universal International Pictures. IMDb rating: 5.8/10. Tomatometer: 71% Fresh. Metacritic: N/A. In first half of the fifties, primarily three major studios dabbled in science fiction. Paramount was the front runner, thanks to the lavish Technicolor sci-fi epics of George Pal. Warner got in it for the money when they realised there was a profit to be made from giant radioactive monsters like those in The Beast from 20,000 Fathoms (1953, review) and Them! (1954, review). Universal was probably the one that made the most interesting pictures, because of their range and their quirks. 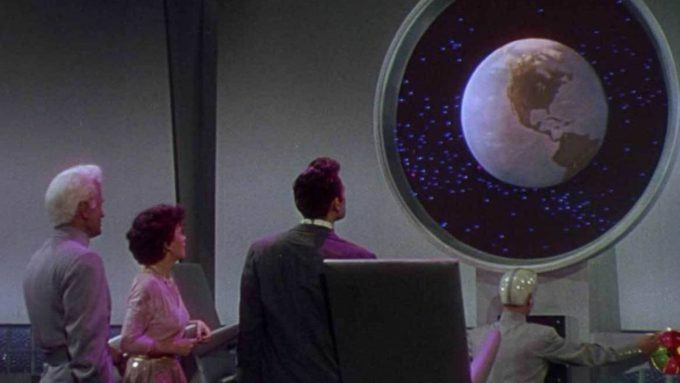 And in 1955, the studio made their most expensive science fiction film to that date, This Island Earth, an ambitious space opera in Technicolor with impressive effects and artwork.